The usual fake news sources are reporting on Trump protesters in London, which reminded me of fifteen years ago. I was in London during Bush’s 2003 visit. 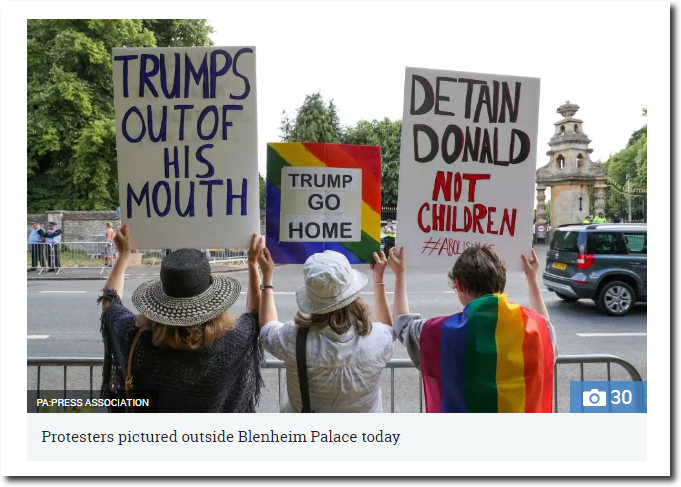 There were about six stoners holding signs in front of Buckingham Palace, and CNN reported it as a massive protest. Later CNN reported that tens of thousands of protesters were in Trafalgar Square. I was in Trafalgar Square (which isn’t big enough to hold more than a couple of thousand people) during the protest. There were also a couple of hundred of marchers surrounded by a line of police marching down Oxford Street. There was a big event however that week. England won the Rugby World Cup, and the pubs were full to the brim at 8am in cold, pouring rain. About half a million people lined up on Whitehall for the parade when the team returned from Australia. People were singing and partying all night long in Leicester Square. CNN must have gotten that confused with their imaginary protesters. Either they have no knowledge of their own history, or they must be counting on there not being another World War any time soon. Sad. Not much rejoicing this week. Then Croatia destroys their last of hopes. Lots of support for ‘the Donald’ here. We thought he handled the Nato talks very well, put Merkel back in her box and made the point (our point) about energy security. Thanks for the live update. Personally, I pay precisely zero attention to the media. 2009 Climategate was the last straw – it was clear they lie about everything. Well-the usual deep state tactic. Crowd size matters (to the MSM). 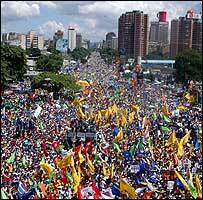 The 2006 opposition candidate to Hugo Chavez, in Venezuela, was drawing massive crowds (perhaps millions). The BBC reported this crowd size as ‘thousands.’ (this is the pic accompanying the story). The US MSM simply didn’t offer any coverage. Chavez was their guy. Police said it was around 70,000. 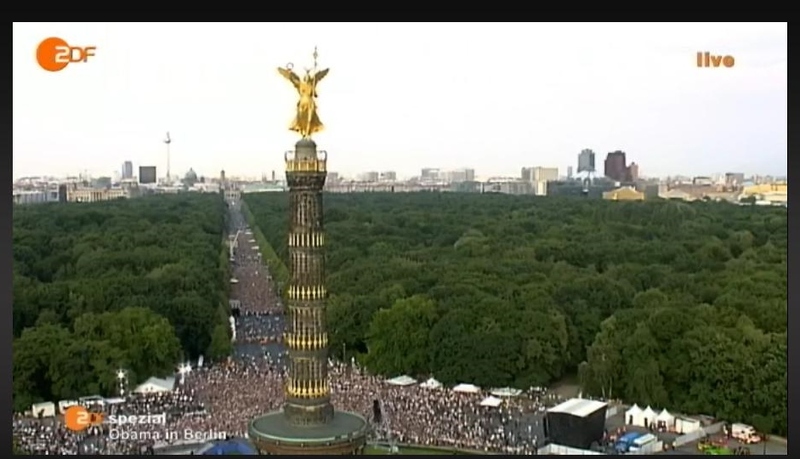 The pic is as he was speaking – I lifted it from German TV live broadcast. Notice all of the empty space – left and right of the podium – and down the boulevard. Closer to 20,000. “While coverage of Senator Obama’s Berlin speech provided audiences here at home nothing less that a visual “shock and awe,” it neglected to mention that the well-hyped speech had an opening act: a gratis concert by two wildly popular groups, Reggae artist Patrice and rock band Reamonn. While we appreciate the Obama Campaign’s hospitality, on behalf of furthering US international relations, offering free bratwurst, pizza and even beer for three hours during the free rock concert, we question whether or not the monies might have been better spent here on financially strapped US citizens. 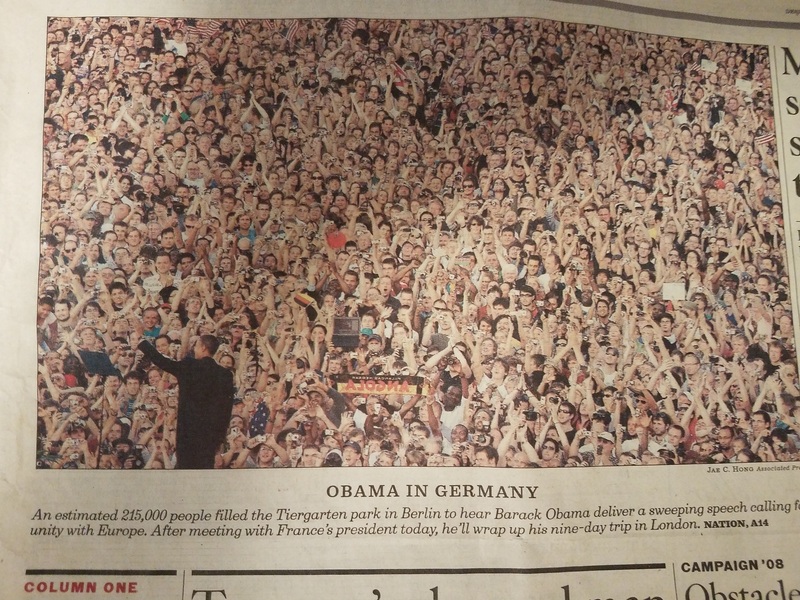 Here’s the zoomed in pic that occupied about 1/3 of the front page of the LAT’s. The weekend before the 4th of July, I met some friends in downtown DC for dinner. However, I heard on fake news radio (WTOP) about massive anti-Trump demonstrations right where I was headed. I almost didn’t go, expecting massive traffic jams. As it turned out DC was a ghost town with plenty of street parking, which is a very rare occurrence. No demonstrations anywhere to be found! Again, (see above) thanks for the real observations. The media has proven over and over they simply cannot be trusted or believed. It’s gotten so bad, whenever they make a claim, I can count on the opposite to be true. True, but I’d say this is good. The media became very reliable. No more guessing. Gees, Didn’t Trump play the EU on the NATO spending !! Always starts from a position of strength, just like N. Korea negotiations. ALWAYS seems to deliver a favourable outcome. Meanwhile most of us unwashed, “dog trained”, bible clinging, gun toting, racist, undereducated, deplorables, just sit and grit our few remaining teeth and wait for the next election day. Roll Tide Roll :), both of them :D.
I was there too, Tony juniper pinched a roll up of me before making a speech at a crammed Grosvenor square. I walked from parliament square to the us embassy and the streets were absolutely full of people, heaving. Was the the same day? ?